You want to enter into new international markets? That requires market-knowledge and intercultural experience. The analysis of your target markets with modern tools and the communication with your target groups can be setup and organised by BLM. Bernd Liebmann, the owner of BLM, is a certified Export Consultant and glad to talk to you about your Export strategies and Business Development. BLM is strongly focused to the markets in Hongkong, China and South East Asia, where many different industries have been supported in their market entry strategies. 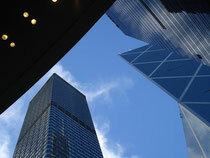 We are also located in Hongkong and Southern China, thus best prepared for a local support of your needs.